Hello fellow DC Fans and welcome to the latest issue of “Confessions of a DC Geek”. In this issue we have one of our very own team members in Adam Carr, I.T expert, Wolverhampton Wanderers fan (a very happy bunny at the moment) and cap wearer! My thanks go to Adam for throwing his cap in the air to take part in this edition of Confessions. As always, this is another great read from a DC fan and gives an idea of what the DC Universe means to, not only Adam, but all fans. If, like Adam, you would like to get involved and, then please contact my via email john@dcworld.org.uk, or by DM to my twitter account @DC_ComicsGeek. You can even get in touch through the DC World twitter account, @_DCWorld, and it will be passed on. I look forward to hearing from you. If you do contact us then I will get back to you, preferably to an email address and the interview questions will be sent to you to be completed and returned back to me, hopefully with pictures. First of all, tell me a bit about yourself – name, age (if willing), where you’re from and what you do for a living, anything else you wish to mention.My name is Adam, I’m 28 and I’m from Premier League Wolverhampton (haha!). I’m a Lead Web Designer and also have run the DCWorld website since the team started and Paul allowed me to help out. I can’t remember a specific moment, but I do remember watching the Batman films, unfortunately George Clooney was my first Batman, but Dean Cain was my first Superman. I always had a liking for Batman and have got a ton of Batman toys still up my parents loft. Batman. Why would it be anyone else. Technically he’s not a Superhero, he’s a vigilante, but that’s why he was always my favourite. He COULD in theory be real. He’s just a guy, who can fight, with gadgets. 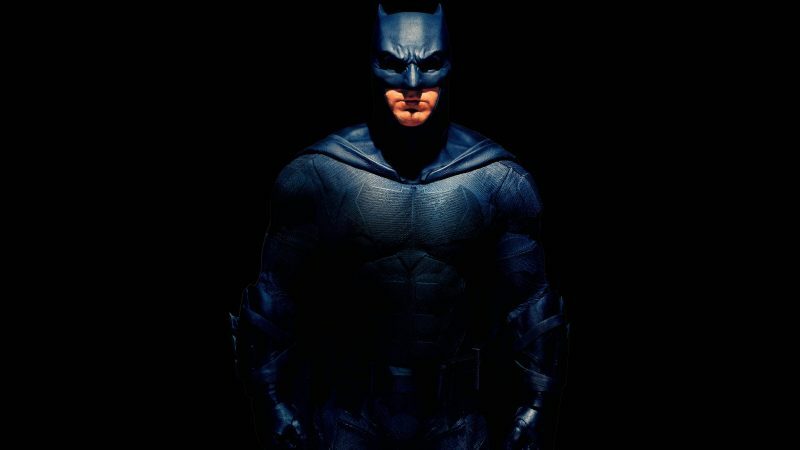 I’m a guy, who can’t fight, but I have gadgets!…so I kind of get Batman’s vibe! Probably has to be Batman. For some the reasons I mentioned earlier. 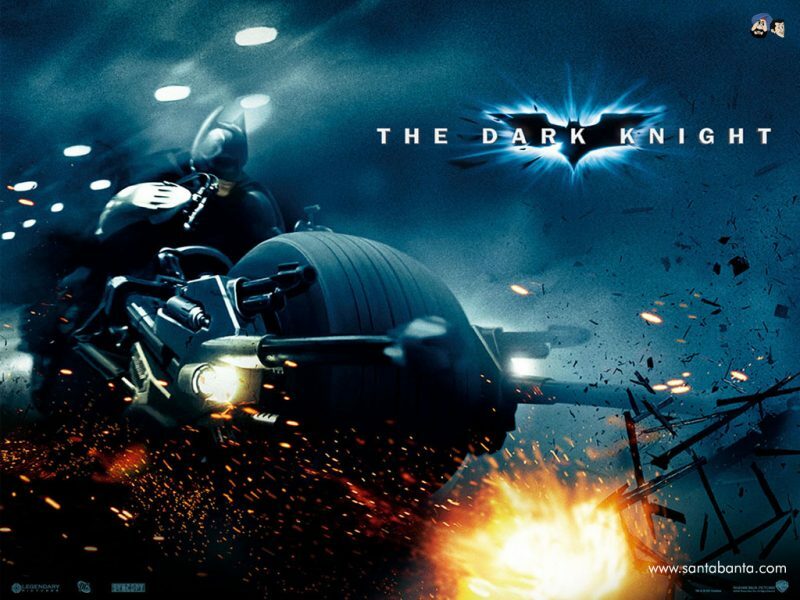 Batman: The Dark Knight is probably my favourite all time DC movie. Heath Ledger’s portrayal as Joker is something I think that has to be cherished by DC fans. Jack Nicholson was great for his time, but Heath Ledger I think will always stand out as the best Joker. 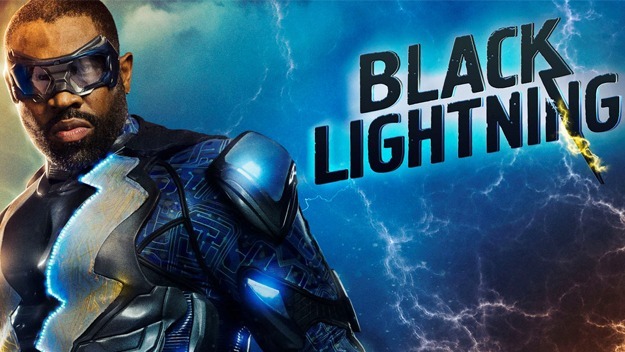 This changes season by season but I’d say currently it’s probably Black Lightning sneaking ahead of Gotham. I like the representation it gives, especially for the issues that have been going on in America lately with Police shooting Black people for seemingly no reason. It shows that not all black people are gangsters, just like not all white people are super heroes. That said, also I love the gang vibe of the show, it makes it feel a lot more real than say, Damien Darhk and his magic hands. Apart from the obvious, give me another DC/Comic Book related website that you visit – any tips for readers? Why would I tip anyone to go anywhere but DCWorld? 😉 We have some of the most enthusiastic and talented DC Comics writers around. One we are going to see very soon actually, Nightwing. 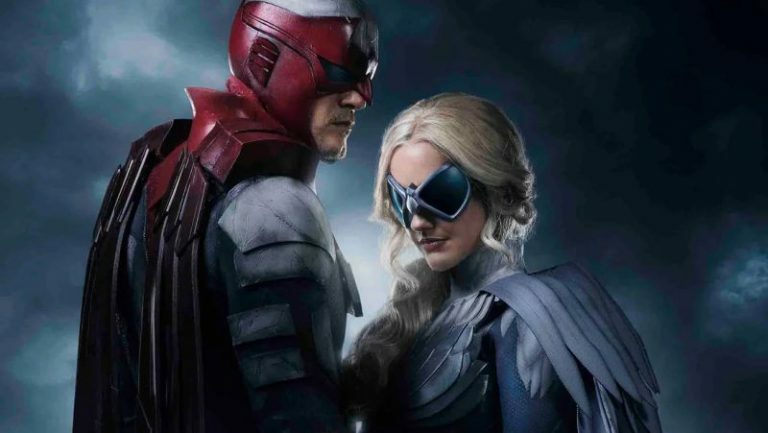 It will be great to see the younger characters of the DC Universe getting a shot at the big time. I can’t wait to watch Teen Titans later this year. Well I would have said The Rock (Dwayne Johnson) but seeing as he’s going to be Black Adam pretty soon I’ll have to rethink on this. I think Idris Elba is a great actor, and I’d love to see him do something with DC, perhaps not Green Lantern however as he’s got the brawn to be more of a vigilante type. It would perhaps be good to see him play someone like Batwing. My favourite actor of all time is probably Dwayne Johnson, I loved The Rock as a kid and have continued to follow his movies as an adult. It will be interesting to see how he takes on Black Adam. I’m afraid I’m not a reader, although I have read a few of the Power Rangers V Justice League comics, some of the older Batman comics, and the Killing Joke. Are you a convention go-er? If so, what has been your favourite memory from any that you have been to? Yes I do love conventions, they are awesome fun checking out all the awesome costumes people make and meeting the stars of the shows. I particularly enjoy panels however. My favourite memory would probably have been meeting now one of my good friends and DCWorld creator Paul Edwards. It’s great to make friends and Paul is a great guy! 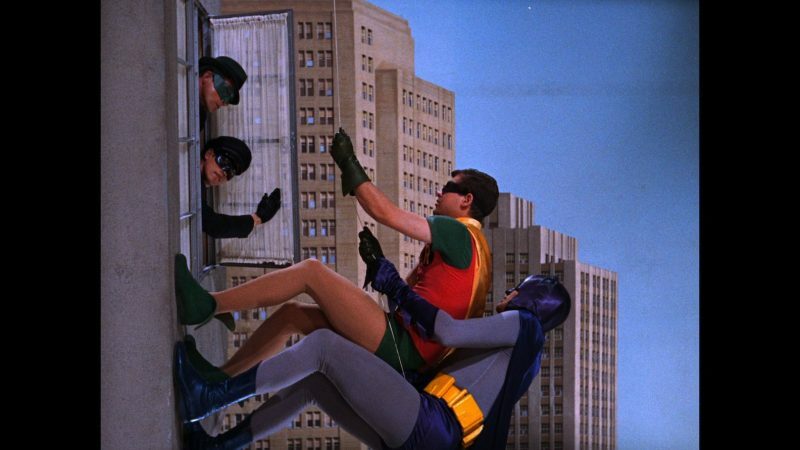 This week’s controversial question: This time it relates to Batman, so, scaling up a wall – is it done better in the 60’s series where Batman & Robin often scale or in the movie Batman & Robin where we see the Batmobile scale a wall? I am a big fan of funkos and my collection is slowly growing because we live in an apartment currently. I do have a few of the movies and tv series on bluray and DVD too. 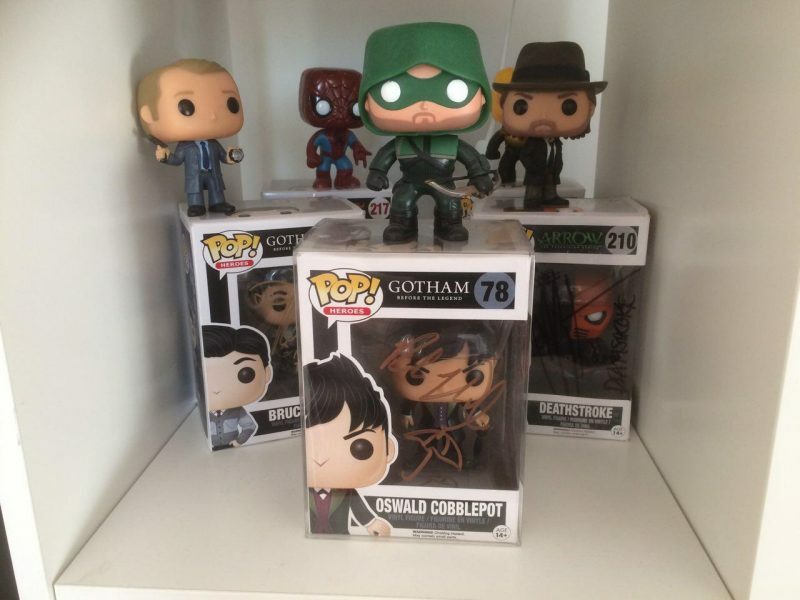 I started off with Arrow and Flash funkos,now I have a range of funkos that I bought and got signed at conventions. But generally all thing DC Comics. Also you might notice Spiderman has been adopted into my collection, I wouldn’t mind Spiderman joining DC, he’s the only Marvel property I ever really got into. I would say probably my signed Deathstroke Funko. I got it signed by Manu Bennett last year. Nothing strange to my knowledge, although we did get a Lego Batman cardboard cutout from Sainsburys that we have tried to use in a giveaway for DCWorld, but the winner unfortunately didn’t want it! Probably my limited edition Batman funko the silver metallic one. I don’t really show them off, But probably as above really, and our signed funkos by Wentworth Miller, Manu Bennett, David Mazouz, Robin Lord Taylor. After asking about conventions above (this question only relevant if you attend of course), what sort of items would you generally come home with, if any, or is it just about the experience? Hats and Tshirts mainly, I’ve got a thing for caps and tshirts. I don’t really get photos, I don’t like having my photo taken so it’s more about the experience and merch. I’d like to get my Flash Funko signed by Grant Gustin and/or Ezra Miller. That would be cool. I’ll also get one signed by John Wesley Shipp in a few months at Collectormania hopefully! I’ve got a Deadshot large figure that was sent to me by Mr Paul Edwards, that possibly could be the most valuable thing, Or again the signed funkos. Least avaluable is probably the Justice League Flash wrist band I got from Odeon for free when I went to see Justice League! And there we have it. Another issue/edition, or whatever you want to call it, comes to an end. I know, and I feel your pain, it’s all very sad but, don’t worry, we will have another edition coming to you very soon where we will reach double figures. Fantastic. Again, my most sincere thanks to Adam for doffing his cap and taking part. I am sure you will agree that Adam falls within the category of “DC Geek”, especially having a love of all things Batman. Therefore, if you have enjoyed reading this and feel that you could also fit the category of DC Geek the please, get in touch (details repeated below) and we will get you on the site. As I say every time, this is a segment of the site that we all thoroughly enjoy and one I certainly have fun putting together. It is great getting to know other fans of the DC Universe and readers to our website so the more of you that come forward to take part, the better. We are a fan site after all, so this is where we want to see you all involved. I hope to hear from some of you very soon. CONFESSIONS OF A DC GEEK WILL BE BACK, SAME BAT-TIME, SAME BAT-WEBSITE!